By Bruce Fife, N.D. | Foreword by Jon J. Kabara, Ph.D.
For years, The Coconut Oil Miracle has been a reliable guide for men and women alike. Now in its fifth edition, this revised and updated version has even more information on the benefits of coconut oil and shows readers how to use it for maximum effect, including a nutrition plan with 50 delicious recipes. Coconut oil is much more than just a fad. It is a uniquely curative elixir that has been shown to have countless health benefits. Coconut oil has been called the “healthiest dietary oil on earth.” If you’re not using coconut oil for your daily cooking and body care needs you’re missing out on one of nature’s most amazing health products. 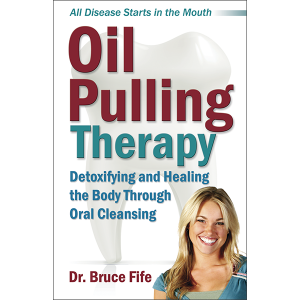 Dr. Bruce Fife is widely recognized as one of the leading authorities on the health benefits of coconut oil. 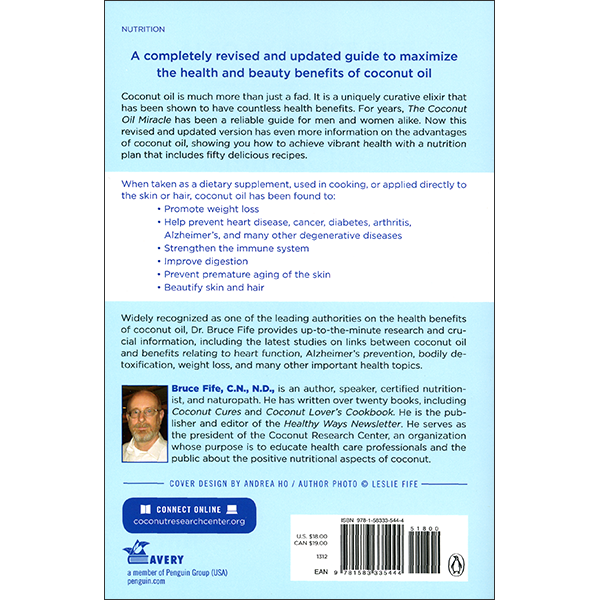 This newest edition of The Coconut Oil Miracle is updated with crucial information, including the latest studies on links between coconut oil and benefits relating to heart function, Alzheimer’s prevention, bodily detoxification, weight loss, and many other hot topics. Bruce Fife has done it again! Just when I thought that Saturated Fat May Save Your Life was perhaps the greatest health book ever written, along comes The Coconut Oil Miracle. This book should be at the top of the “must read” list for anyone who is seriously interested in taking charge of their health. Coconut oil and it’s associated Medium Chain Fatty Acids are indeed true health miracles. They prevent & even reverse everything from infections to viruses (including the flu) to germs and bacteria of many types. And it does so far better than any medical drugs can, and without any side effects what so ever. The Coconut Oil Miracle explodes these lies once and for all, and provides concrete proof to support the author’s conclusions. I have been involved in the nutritional supplement & health food store fields for 8 years, and I can honestly tell you this is the kind of information millions of health-conscious Americans are desperately seeking. Not only will it be impossible for you to put this book down, you should show it to everybody that you truly care about, especially those that suffer from excessive weight, heart disease, cancer, diabetes and immune system disorders. And show The Coconut Oil Miracle to your doctor. It’s 99% likely he/she will not know this information. And if you or someone you know is pregnant / breast-feeding, it is essential that they know about the importance of healthy breast milk to their child (especially if they use coconut oil /milk. Your /their child’s life may depend upon it! Don’t wait – order The Coconut Oil Miracle – now! By using only one tip in this book, my husband was able to get rid of an athletes foot problem he had suffered with for months. He had tried EVERY over-the-counter preparation. Finally went to the doctor. He was given a prescription for a 30 day supply of pills. The cost was over $200! Counseling with the pharmacist and discovering that PERMANENT health damage could result made us decide to NOT use the pills. We did find the cure for the athlete’s foot in this book–the cost was $3.99 (swansonvitamins.com) without any side effects. Caprylic acid! One 600 mg soft gel daily until the bottle was finished. Coconut oil contains caprylic acid. We also started using virgin coconut oil and canned coconut milk–be sure to buy the brand with the HIGHEST fat content. Ten ounces of the canned coconut milk daily is enough to provide a healing dose of coconut oil. It can be used in smoothies, pudding, on oatmeal, in cooking, in soups and stews. I also add some to my tea or coffee. Simply refrigerate the canned coconut milk after opening. It will solidify in the refrigerator (melting temp. 76 degrees) – Spoon onto oatmeal or into hot beverages. I also need to share that the reason I found this info on coconut oil is because I began having thyroid problems and was doing some web searching for info. SOY was causing me to grow a goiter and causing other thyroid problems. The problems reversed after eliminating soy from my diet–no small task as it is in EVERYTHING. (Note: lecithin is soy). Try doing a web search by entering: soy danger. Shocking! This book is well written and easy to understand. I am buying additional copies to share with others. I admit it. I bought into all the big business hype about how bad coconut oil was for me. After reading this book and altering my diet, I see how wrong I was to believe the misinformation I was being fed. The saturated fat in coconut oil is actually good for you and helps keep you healthy in so many ways. An interesting and amazing book backed up by history and fact. I just wish it had not been repetitive at times and at other times a bit hard to my layman’s sensibilities to understand, but those are small quibbles. I enjoyed reading it and got through it fairly quickly. You’ll want to keep a copy for yourself and get one for someone you love, it’s that convincing! I’ve been using coconut oil and avoiding other vegetable and hydrogenated oils since reading it and I feel better and have more energy. Read it for yourself and become a convert. I very much enjoyed reading this book. Much information is given on the health benefits (yes BENEFITS) of saturated fats, the “smear” campaign of the vegetable oil industry, and practical application of coconut oil for many health problems. Coconut oil DEFINITELY helps me to eat less and have more energy. It took a couple of days for it to kick in, but now when I eat a meal with 1 T of coconut oil, I don’t have to eat for HOURS, where previously, I felt compelled to eat every 2 hours–and thus, overeating. The coconut oil is keeping me healthy; it eliminated a sinus infection much quicker than antibiotics, without the side effects. 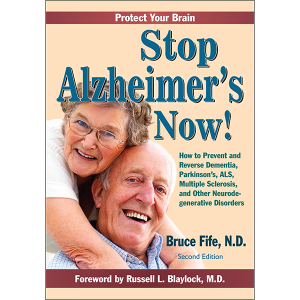 Please look into this book–it can seriously improve your health. If you’ve always suspected that coconuts are good for you because so many people have been eating them for so long with only positive health outcomes then you’re right!!! What you probably don’t know is exactly why they’re good for you. You probably don’t suspect exactly how many things coconuts are good for either. This book is well written, easy to read, explains things in fairly simple language and repeats things regularly so you will remember. It’s full of information about things like: losing weight, keloid scarring, diabetes, the immune system (anti-bacterial, anti-viral), beauty, cancer & heart disease! That’s the short list. Most came as a total surprise. For someone who though they had read most of the key health info it was a bit of a shock! It’s even better because they’ve bothered to explain how it works. Once you know how it works you can then go and apply the knowledge to things they haven’t mentioned. It’s a bit like giving a man a fish or teaching him how to fish! You’ll be a bit of an expert on all kinds of fats by the time you finish this book! It helped pull together other information on fats in a coherent fashion. I couldn’t put this book down! If you’re dubious… don’t delay. It’s definitely money well spent. This book contains a lot of information that is mostly unknown to the public, due largely to the politics involving powerful agribusiness interests in this country. (I’d really like to give it only 4-1/2 stars, however, due to the poor editing.) Learn about what is probably one of the healthiest oils you can consume, and yet has become difficult to find in grocery stores. And it’s sad to learn that we’ve been pushing less-healthful oils (corn, soy, etc.) on developing countries as a replacement for their coconut oil, with the result that the people there are suffering more degenerative disease. The author has also written a book called Eat Fat Look Thin, which details a low-carbohydrate coconut diet to help with weight loss. I have suffered with digestive problems my entire life. After reading this book and incorporating coconut oil and coconut milk into my diet, I am finally recovering! It truly does seem to be “too good to be true”, but in fact, coconut oil, is a miraculous food for this generation. It is very easy to switch from vegetable oils to coconut oil in all recipes. My family loves the change, and we are now enjoying wonderful smoothies and creamed soups that were “forbidden” because of the high fat content. But, switch to healthy fats and see what happens! A side benefit I am seeing is weight reduction without even trying! 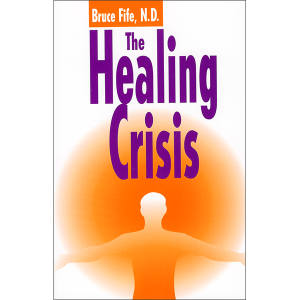 This book is a MUST for those who desire to regain their health and protect the health of their children. A Book to Save Your Life! Fife proceeds early in the book with an anecdote. In response to his assertion to dinner friends that coconut oil is the healthiest oil one can use, one of them countered that “Coconut oil is unhealthy; it can cause heart disease,” to which Fife replied, “That must be why all the Pacific Islanders died off hundreds of years ago. Fife takes the reader carefully through the chemistry of fats with brevity and clarity. Lay readers can easily understand him as they are led through an explanation of the differences between the various fats. “Healing miracles” is not an overstatement to describe the effects of coconut oil. Fife details some 40 different health benefits from the use of this oil–one hesitates to list them for fear of sounding gullible or lunatic–and he thoroughly documents his work with research findings. If you love your family and yourself, read this book! I am not sure of all the claims in the book but I applied coconut oil liberally on my toddler’s scalp and it cleared up the remainder of her cradle cap. She also had some dry patches of skin that coconut oil cleared up. I’d used baby oil, and medicated shampoos to no avail. Coconut oil worked when nothing else did. After reading this book I threw out my current oils and changed the way I cooked and looked at food. I bought this book for my mother and I have an extra copy for other people to read. As a member of the health care profession people come to me all the time for information. I was totally surprised by what has happened to all of us and what is being sold to us as “HEALTHY”. Even our doctors don’t know the truth. My doctor is getting a copy of this book to read. I now use this oil on my skin on a regular basis and being in my mid forties the feeling of my skin is like that of my twenties. I plan on being around for many years and this information will help me be much healthier. I am very glad to be given this information. Thank you Bruce Fife! I am ordering his other books for my library. I was angered by this book. That is, at the soybean and vegetable oil industry, pharmaceutical companies and the medical establishment. I’ve never been big into conspiracy theories, but after reading this I was shocked. I went out and bought 2 tubs of coconut oil and I’ve been telling everyone I can about it and this book. I know and am close to people with heart disease, diabetes, lupus, IBS, and cancer. Even if you are not sick, coconut oil is beneficial in preventing disease and promoting overall wellness. I have started reading ingredient labels at the grocery store and it’s amazing how prevalent vegetable and soybean oil is in the foods people eat. It doesn’t make sense to me why the big businesses say that something Nature put on this earth for us to use would be so bad for us, while the over-processed, refined and rancid vegetable and soy oils are so much better. Oh, wait, I know the reason: money. The Real Miracle is Finding This Book! I did not expect Proctitis. After all, I lift weights, run, have a good outlook on life, and I’M TWENTY! My Doctor was useless. An angel recommended this book. Fifty pages later I understood why we are suffering with so many health problems. Two days later my disease is gone. If you are having trouble losing weight or if you have had your gallbladder removed, or know someone who has, then you must read this book or buy it for them for a gift. I had my gallbladder out at a young age and I’ve always had trouble since then with oils. Now I know why since this book goes into great depth in explaining how oils are utilized by the human body. I have suffered from chronic Candida infestations for years, thanks to this book, I’m now getting the yeast outbreaks under control and finally have hope of eliminating them for good. I saw immediate relief of my pollen related allergies after the first day of using coconut milk on my morning cereal. I highly recommend this book. This is an outstanding book and a must read for everyone who is concerned about the food they take. The book gives 185 research references and makes a convincing case for coconut products. It also explains how oils like canola etc have been “promoted” as healthy oils. My Arteries Are Clogged – With Misinformation! Unfortunately there are only a handful of doctors and health professionals exposing all the myths and total nonsense that gets delivered to us through the media. I still see articles in magazines by doctors telling me how bad coconut oil is and how it clogs my arteries. I have used coconut oil for a year now and feel great. I like to mix virgin organic coconut oil into my organic peanut butter to smooth it up. Makes it taste great! I melt it on my veggies and cook with it exclusively and yet I am fit as a fiddle. So where are the reviews from the people who consistently consume coconut oil and have clogged arteries – anybody? I didn’t think so! Very informative and Easy Read! This is a great book. It gets scientific enough so that you understand and believe the miracle that is coconut oil, but not so scientific as to frustrate or bore the reader. I read this book in one sitting and although i had cooked with coconut oil before, on advice from a nutritionist, i had never known about the applications for skin and hair. My skin has never been so happy! It’s infuriating how we’ve been lied to by the criminal agribusinesses in this country. While reading this book, I kept thinking to myself why doesn’t everyone know this?!?! Hopefully word can spread about this book and the miracle of the coconut! New Info on Coconut Oil! If you would like to loose weight, fight infections (bacterial, viral or fungal,) or improve your family’s nutrition, coconut oil will be of great benefit. The scientific studies to back up Dr. Fife’s assertions are listed as well as easy to understand explanations of fat and oil makeup. Political and economic intrigue are discussed as the reasons for the untruthful maligning of coconut oil. It is shown as a natural, centuries tried and tested aid to health, beauty and longevity. Both its use to alleviate specific health problems and its benefits in preventing many modern ailments are addressed. The time has come—finally—for all, including Western science, to recognize the extreme benefits of the coconut. Fife’s book is excellent and greatly welcomed. The book called AN ELEMENTARY TEXTBOOK OF AYURVEDA by the Yale medical doctor, Frank John Ninivaggi, M.D., did acknowledge the uses of coconut oil as long as 6,000 years ago, and currently in Ayurvedic medicine—the first medical tradition begun in India and still practiced today. I highly recommend and endorse Fife’s book. Take a look at Ayurveda, too! Unbelievable! The lies we’ve been told for 20 years about saturated fats, how unhealthy it was for us, and how vegetable and soybean oils were the best option for overall health. After reading this book, I know why Americans, especially our kids, are so overweight! This book will open your eyes to what we’ve been missing out on all these years. Buy one for yourself and one for someone you care about. Everyone Should Know About Coconut Oil! Bruce Fife does a phenomenal job of explaining about coconut oil and why it’s good for you. Read all of his coconut books! This book is a great source on the benefits of coconut oil! It can your life and health! 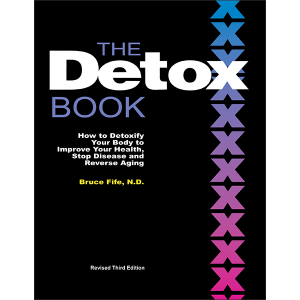 This is a great book for anyone who wants to improve their health. It is well written and easy to read. I have switched my family over to using coconut oil in cooking. There are some recipes in the back to help you on your way. I highly recommend this book. This will completely change any pre-conceived ideas you may have about coconut oil. Lots of wonderful and informative information that you should have already known a real education. My wife and I have found lots of useful ways to use the oil. One of the best ways is use instead of butter on a toasted bagel or English muffin and then cover with peanut butter, low cal is fine. And, you may also use the oil in replacing vegetable oil for cooking. But, don’t let me give up all of the secrets from the book – Extremely informative and useful. Well worth the purchase. This is a very informative book about the many uses and advantages of coconut oil. Personally I am using it on my skin and hair and also cooking with it. I am 71 but see a real difference in my skin. I recommend it to everyone. This book is a must for you, if you are interested in what you eat. After reading it you understand very well why coconut oil is good for you. The book is well written and it has answered all my questions. I highly recommend! My neighbor recommended this book to me a few months ago. He and his wife have been using coconut oil since he had open heart surgery a few years ago. They use it in place of butter/margarine. They also stir it into their morning tea. I was so astonished to learn that coconut oil is healthy that I had to order this book to learn more about it. This informative and educational book debunks the myths about coconut oil, and teaches how coconut oil is very, very good for you – Includes recipes. 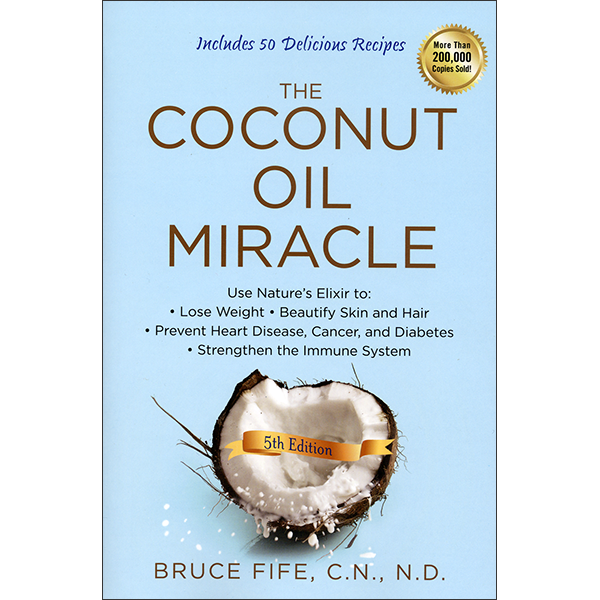 The Coconut Oil Miracle (Previously published as The Healing Miracle of Coconut Oil)by Bruce Fife is a highly acclaimed book about coconut oil. Bruce Fife provides all the answers about commons myths and misconceptions about coconut oil. Eating coconut oil on a regular basis can reduce your chances of suffering a heart attack! Coconut oil is composed of a group of unique fat molecules known as medium-chain fatty acids. ‘Though they are technically classified as saturated fats, this fat can actually protect you from getting a heart attack or suffering a stroke. A much more accurate way to judge heart disease risk is to separate the two types of cholesterol. Therefore, the ratio of the bad to good cholesterol (LDL/HDL) is universally recognized as a far more accurate indicator of heart disease risk. Because of coconut oil’s tendency to increase HDL, the cholesterol ratio improves and thus decreases risk of heart disease. People who traditionally consume large quantities of coconut oil as part of their ordinary diet have a very low incidence of heart disease and have normal blood cholesterol levels. This has been well supported by numerous studies. The research shows that those people who consume large quantities of coconut oil have remarkably good cardiovascular health. Research has demonstrated that medium-chain fats in coconut oil protect against heart disease and may one day even be used as a treatment to cure it. * Lower incidence of heart disease in population studies. From this evidence alone coconut oil should be viewed as heart healthy or at least benign as far as heart disease is concerned. But there is another factor that is even more important, that reveals coconut oil as not simply a benign bystander but a very important player in the battle against heart disease. So remarkable is it that it may soon become a powerful new weapon used against heart disease. Heart disease, stroke, and atherosclerosis account for nearly half of all the deaths in the United States. Statistically, one out of every two people you know will die from one of these cardiovascular conditions. In countries where people eat a lot of coconut products cardiovascular disease is much less frequent. It appears that by simply using coconut oil in you daily diet in place of other oils you can achieve a remarkable degree of protection from heart disease and stroke.